A banner advertising "Irish Car Bomb" cocktails at a pub near the sites of two 1970s bombings in Bristol has been censored. The Brass Pig pub on The Triangle put up the banner to promote its St Patrick's Day celebrations. Local author and journalist Maurice Fells, who covered both attacks as a journalist, said it was "unbelievable" considering the area's history. Pub officials said the advert was "wrong" and have now covered it over. Bristol was bombed twice - in 1974 and 1978 - both on sites near to the pub. The Brass Pig on The Triangle is less than half a mile from Park Street, which was bombed on 18 December 1974. That attack was blamed on a local terror group. The Reading Eagle reported at the time that 20 people had been injured. Ken Stradling, 90, chairman of Bristol Guild on Park Street, was part of a party working late and recalled the "tremendous noise" of the bomb exploding outside the shop next door. "The whole shop window shattered and sent glass flying," he said. A second bombing at Maggs Department Store in Clifton - about half a mile in the opposite direction - happened on 17 December 1978. In that attack 18 people were injured, according to Mr Fells. It was part of a co-ordinated Provisional IRA attack with bombs exploding in Bristol, Coventry, Liverpool, Manchester and Southampton. 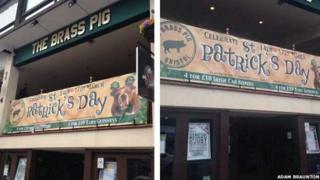 Mr Fells said the marketing people behind the pub's St Patrick's Day banner had been "clueless". He said: "People were hurt - thankfully people were not killed but to play on this is ridiculous. "As a marketing ploy it's unbelievable that anyone would have thought of it… people have strong memories in Bristol and the West Country." Claire Deeley, marketing spokeswoman for the Brass Pig, said the banner had been put up by staff who thought they were being "enterprising". However, she said that as soon as managers saw it the banner was covered over with tape. The Irish Car Bomb cocktail is made by adding Baileys and Jameson Irish Whiskey to a shot glass. The shot glass is then dropped into a half-pint of Guinness and drunk quickly.